The work of the Black Vulture feeding off carcasses invites us to reflect on the work with the elimination of the “I” at a deeper level. At this stage we face our defects that hide submerged deep within our psyche. Here we discover defects we never suspected we had, psychological aggregates deeply rooted in our infra-consciousness. Our subconscious hosts dense psychological aggregates we must discover and eliminate. The work the Black Vulture has in nature is the same work we have to perform deep within ourselves. The elimination of the lustful aspects that are deeply submerged, of those distinct impulses of envy that make our life miserable… in fact, all those defects that are true filth and putrefaction in our interior world. Regent God: It is related to the elder and longevity as well as related to the need to make the most of the chaff, the waste. 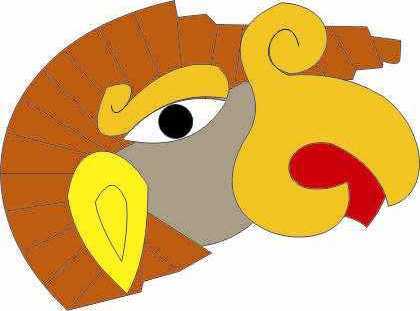 The vulture, Cozcacuauhtli, represents the sixteenth sign and is shown with a long white beak and a pendant hanging from its ear shaped like a little bell (oyohualli). It occasionally sports the trapecious and the ray, are adornments attributed to Chantico, the Goddess of Fire. The baldness on its head is represented in the Borgia Codex by a red zone next to the eyes and the bald aspect by itself, as a symbol of the old age. It also used to be represented with the hairdo and adornments of the God of Fire. Other codices represent this animal with an Owl, bird of the dead. Itzpapalotl (the Obsidian Butterfly) is the regent of this sign and of Tamoanchan, the land of primordial origins. The Location of the Day in the Borgia Codex: On his shield, as it relates to the psychological death we must endure and this death, but itself, protects us from adversity.